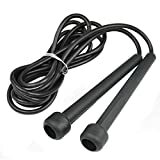 Professional style plastic swift skipping rope. Excellent quality material that enables the user to speed skip. Ideal for use on the basketball courts or football pitch, this classic jump rope can help you keep your cardio up, and you lasting for longer. Excellent grip for better movement. A smart professional lightweight plastic skipping rope ideal for use in gyms and boxing. Length: 245cm (not including handle).